" Signs of canine mange depend on the kind of mite causing the infestation . The type of mite determines the form of mange your dog is suffering from. 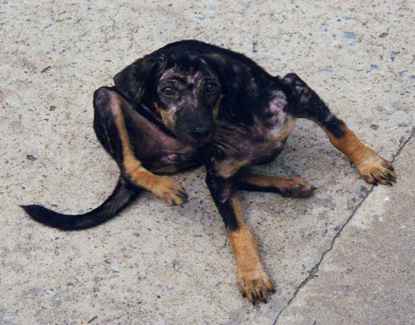 Clinical signs for mange may range from localized irritation, hair loss & rashes to a severe generalized diseased condition and even to death. Signs and symptoms of mange are sometime specific and can be helpful in identifying the type mange your dog is suffering from. " In general, signs of canine mange may be characterized as itching or irritation, redness at the area affected (hyper pigmentation), alopecia (hair loss), wounds in case of self injury due to scuffing, and in more severe conditions, typical signs of secondary bacterial infections, i.e. systemic illness, fever, loss of condition, lymphadenopathy (enlarged/Diseased lymph nodes) and pyoderma (Skin infection with puss under skin). Ododectic Mange: the head region and ears are the only affected parts. The mites infest inner ears and surroundings of ears at head only. Consistent head shake and ear scratching, lesions appear at ears & in case of inner ear infestation more complications may also be seen. 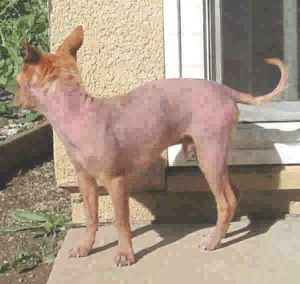 Red Mange (Demodectic Mange): Similarly, if a dog has red mange, it can develop to a generalized form with systemic illness (affecting systems along with “Integumentary system” (Skin) like immune system & thermoregulatory system of the body. It is usually considered self resolving, meaning it preferably doesn’t require systemic course of treatment. Young dogs, aged dogs or dogs with immature immune system are more susceptible to this form. The primary signs are that of alopecia (hair loss) in patches, at the head, ear, neck, abdomen and legs. Irritation or itching is mild or absent. More over the diffused form develops to generalize form, due to secondary bacterial infection and suppressed immune system. Systemic illness, fever, lethargy and pyoderma may be signs of red mange. Presence of other diseases such as heart worm disease or hypothyroidism along with mange is another representation of red mange. Sarcoptic Scabies: Sarcoptic mange is characterized by severe itching or irritation. Papular eruptions on self injury (itching, irritation and scratching by your dog) can develop into crusts. Level of self trauma or injury also indicates the severity of the infestation. The lesions are seen on abdomen, chest, legs, ear, head and elbows. Chronic scabies may represent themselves in a generalized form, where scar formation, hardened skin and seborrhea, systemic illness & severe lymphadenopathy are primary signs of a chronic condition along with signs of secondary bacterial infection i.e. fever, emaciation & loss of conditions. As Sarcoptic mange is a contagious form of mange, transmission to other dogs that have come in contact with the diseased dog is another helping sign. Signs of Cheyletiellosis (Walking Dandruff): A major sign of this form of mange is hair loss in patches, but only at the dorsal surface i.e. on back only. In severe conditions the hair loss is extended & itching may also be noticed along with redness and itching. Signs of Trombiculiasis: Associated with range dogs, this form is characterized by small, red and pin stab skin rashes distributed at the body, which is a type of wound or injury that is penetrated deep in skin tissues vertical to the surface such as an injury as of sharp pin, like injuries due to mange are only noticed in the range dogs. This type of symptom is not be commonly seen in housed dogs. Mange is treated with both the use of a dip and/or prescription medications via injection (Ivermectin) for 2 to 4 weeks when needed. 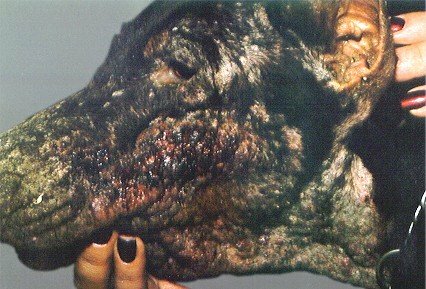 To treat sarcoptic and domodectic mange at home buy a dip such as the one made by Dermisil, which uses lime-sulfer, a very effetive and safe product for fighting mange. it conveniently mixes with your dog's shampoo. Prescription dips contain amitraz, which can have harmful side effects. To prevent future mite infestations you can try a homeopathic spray called Mange Mites Spray that users natural ingredients to safely discourage pests from infesting your dog's skin. To avoid the risk of mange returning, You should also make sure that mites are removed from your dog's environment and your home. One product worth researching for this purpose is Benzarid.